I’ll only ever send you notifications of new blog posts. Sadly I can’t differentiate between kinds of posts, so if you want to get the WRR you’ll have to cope with my training log as well. Thanks very much for signing up. Cajsa and I do the Women’s Running Roundup for the love of it because we cant to show that this sport is really interesting and that there are amazing things happening in women’s running So, please do tell others and share the love. It's definitely Summer on the trails. Opt for a less trodden footpath on your ramble and chances are you will either end up on the set of "Honey I Shrunk The Kids", surrounded by jungle sized Nettles with dehydrated hallucinations of Giant Ants lurking behind the next stile or striding for life whilst being chased down by a brood of brawly young Ferdinands and their over protective mums. The borders of the farmed fields have turned into a dusty dry crust, the hydration-vest tan lines are here to stay til' November and the start lists of the alp based races are hawt hawt hawt! 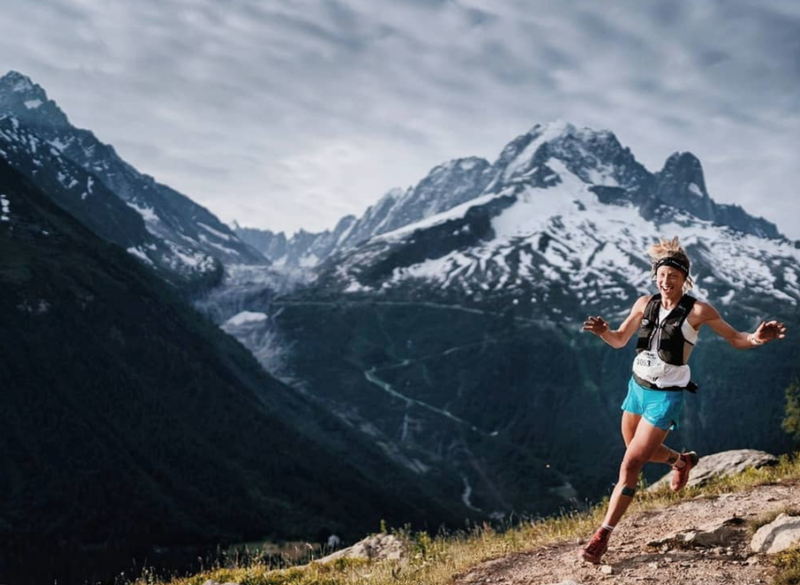 The pace set by Sweden's Mimmi Kotka on the longest course of this classic Chamonix race was giving us all the reasons to believe she was having at least a field full of angry french bulls on her tail. Considering that she was running in OA bronze position for the majority of the race I guess you could say that was not far from the truth! After taking a tumble on one of the latter descents Kotka lost touch with the OA top ten but there was nothing stopping her from repeating her 2017 victory in the women's race. With blood dripping from both knees she crossed the finish line in 12:09:45 over an hour ahead of Audrey Tanguy from France. Third female to the podium, two hours behind Kotka, was Marion Delespierre who improved greatly on her 10th place from last years MTMB. GB's Rachel Campbell got a sweet revenge on her DNF at this years World Championships by finishing 6th lady in 15:49. A strong race by last years UTLO winner who had a 30 minutes margin to second Brit (but chamonix based) Tanya Rainbird. With Caroline Chaverot dropping out early in the race there was not much competition for Mimmi Kotka this weekend but I still believe this performance proves her to be in shape to, if not win, at least be on the podium at this years UTMB. As impressive as Mimmi's dominance on the ultra course turned out to be it was the 42 km sister edition that provided the biggest entertainment of the weekend. Both by having a more competitive starting field leading to a tighter race and also for being streamed live on Salomon's Facebook page. It's not often that we get the chance to see live trail running outside of UTMB and this second instalment of Salomon's Golden Trail series really delivered the goods for an exciting race (lets hope that the olympic gods were tuned in and we get to see a mountain ultra included in the games in the future). Zegama- champion Ida Nilsson and third lady Ruth Croft played a furious cat and mouse game with Spain's Eli Gordon over the fast first half of the race. Nilsson held onto the lead with Gordon breathing down her neck until the first big climb at 20 k when Croft shifted into chamois gear and took the front seat. She managed to hold off the chase pack all the way home to the finish but there was no time to stop and tie your shoelaces, this was a tight race to the very end with only three minutes between winner Croft and third lady Gordon. Anne Lise Rousset claimed fourth place just two minutes ahead of Megan Kimmel who put up a good fight considering she's only two weeks out of breaking the course record at Broken Arrow Skyrace. Big British Shout Out to Jo Meek (blog) and Emma Clayton placing 11th and 14th in such a stacked field. And now to the weekly Skyrunner World Series report (how do they do it!?) and with that some bling for Great Britain because back from last weekends win at Monte Rosa was Holly Page! Not only did she manage to recover enough in the past seven days to claim her second victory of this seasons Skyrunner Series but she did it with some margin too. Holly finished in 5:03 a whole 24 minutes ahead of last years champion Oihana Azkorbebeitia. Third lady was Mercedes Pila in 5:30. This beast crossing all peaks over 3000 ft in Wales began as a strictly vegan entries only event but is now open to runners of all kind of culinary cultures (you have to adhere to a plant based diet for race day though) and has become a classic on the UK sky running calendar. For the seventh time runners took to the scramble packed route over iconic ridges such as Elidir Fawr, Carnedd Dafydd and, since the weather was kind enough; the mighty Crib Goch (in other words; not one for the faint hearted …). The sunny spell might not have been all in the runners favour though since the V3K is a race with no aid stations and thus demands all entrants to carry what they might need to consume during the race. With temperatures reaching the higher end of the 20's and in exposed mountain terrain that would mean a lot of added weight. Last years Pen Llyn Ultra champion Nia Albiston did not seem to be faced by the burden of extra baggage and dominated the women's race to finish in ten hours with a two hour margin down to second lady Jackie Toal. Rounding up the podium with a finishing time of 13:44 was Claire Prosser. V3K wasn't the only race using Snowdon for its back drop this weekend, Endurancelife also headed to North Wales with a less punchy new chapter of their Quarter Series. Fastest lady over the course running from Borth-y-Gest on the west coast to Conwy in the North was Ellie Tait finishing in 13:20. Twelve minutes behind was Keziah Trump and on third place with a finishing time of 14:09 was Beate Stindt. Next weekend the Mavericks return to the Peaks, this time with their X-series where you can test your mountain legs over the marathon and half marathon distance. In other none-race news the legend that is Nicky Spinks attempted to complete a Double Ramsay Round in under 48 hours over the weekend. Sadly the un-British heat put her back a bit and she missed the sub 48 window and finished in 55:56. Fingers crossed for Emelie Forsberg to have a better go as she sets out to run the 450 km long trail of Kungsleden from Tarnaby to Narvik in her native Sweden. May the midnight sun be with her! It's time to let the dust of the battles from the past few weeks settle and we can look forward to a bit of peace and quiet on the big international scene for the next seven days. Well with the exception of the SkyRunning World Series that is. Those guys just don't want to hear about cut back weeks and this time they are back with a lil' climb up Tignes in the High Trail Vanoise 70 k.
Whilst the elites might be elevating their tired legs there are plenty of smaller scale races for us mortals to stretch out on over the next weekend so watch this space and as always; holler if you have an event coming up that you think we should be covering! One of the few Gold standard IAAF around this time of year, the Gold Coast Marathon was always going to be interesting given that it was in the same location as the Commonwealth games 2 months before. Not only was it not confined to commonwealth countries, but one could also argue that Kenya did not field its strongest athletes in the earlier competition and therefore this could be a more honest race. So, with Namibia's Johannes Helalia taking the win back in April in 2:32:40 with Australia's Weightman and Trengove in 2nd and third, who would bagsie the top spots in the re-match? Rather predicatbly (WRR called it last week) it was indeed a Kenyan athlete who broke the tape, with Ruth Chebitok bringing down her PB for a second time this year (Barcelona, March ,2:25:49) and coming first in a faster-than-CWG and course record time of 2:24:49. While fellow Kenyan Agnes Barsosio had a faster PB going into the race, the fact that she had not raced this year obviously wasn't a fresh-legs advantage as she finished in third. Stepping up from 3rd at the CWG to 2nd was Jessica Trengove who finished in a PB of 2:26:31. That's just under 8 minutes faster than her CWG time and represents a tasty and well-earned pay packet - Trengove will take home the $40,000on offer for Australian female athletes who ran sub 2:28 as well as the $8,000 runner up prize. In the half marathon Sara Hall of USA continues to get stronger and faster as she took 40s off her PB to take the win in1:09:27. Irish born Australian Sinead Diver came second and annihilated her previous PB of 1:11:40 to finish in 1:09:53. Third went to Saucony athlete Laura Thweatt in another new PB 1:10:15. Looks like it was a good day for smashing those personal records! On the GB front, Lily's loss was Sabine Huebner's gain as she was first home in 1:54:55 with Jennie Dunkley next in 1:56:10 and Elizabeth Hulmes in 2:05:10. All these ladies are actually registered as GB athletes in the results, though they currently run for Berlin and Hamburg. Starting from Kirkwall, Orkney's St. Magnus Cathedral this is the UK's most northerly marathon, in Orkney. It was the third year this race has taken place. It may have a modest participation of 23 ladies and 43 men but I imagine that it is quite the experience. Karen McLaughlin (V45) of Springwell RC ran a 7+minute PB to win the race which had been organised in honour of the 30th anniversary of Larne RC. It was originally held back in the 1980’s and was named the Nescafe Coast Road Marathon - Ron Hill ran it back in the day. The route looks absolutely stunning. Check it out here. 2. Patricia Blair - 3:20:13. England Athletics have announced the names of runners from V35 upwards who have qualified for the England Team that will compete in Chester against a Celtic Nations Team at Chester Marathon on 7th October 2018. Full list and current PB's below. Congratulations to all those who made the team. Jacqueline Millett (Serpentine RC) ? ?